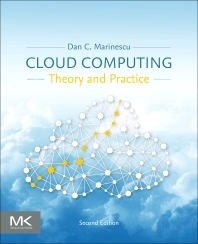 Cloud Computing: Theory and Practice, Second Edition, provides students and IT professionals with an in-depth analysis of the cloud from the ground up. After an introduction to network-centric computing and network-centric content in Chapter One, the book is organized into four sections. Section One reviews basic concepts of concurrency and parallel and distributed systems. Section Two presents such critical components of the cloud ecosystem as cloud service providers, cloud access, cloud data storage, and cloud hardware and software. Section Three covers cloud applications and cloud security, while Section Four presents research topics in cloud computing. Specific topics covered include resource virtualization, resource management and scheduling, and advanced topics like the impact of scale on efficiency, cloud scheduling subject to deadlines, alternative cloud architectures, and vehicular clouds. An included glossary covers terms grouped in several categories, from general to services, virtualization, desirable attributes and security. Dan C. Marinescu was a Professor of Computer Science at Purdue University in West Lafayette, Indiana from 1984 till 2001 when he joined the Computer Science Department at the University of Central Florida. He has held visiting faculty positions at IBM T. J. Watson Research Center, Yorktown Heights, New York; Institute of Information Sciences, Beijing ; Scalable Systems Division of Intel Corporation; Deutsche Telecom; and INRIA Rocquancourt in France. In 2012 he was a Fulbright Professor at UTFSM (Universidad Tecnica Federico Santa Maria) in Valparaiso, Chile. His research interests cover parallel and distributed systems, cloud computing, scientific computing, and quantum computing and quantum information theory. He has published more than 220 papers in refereed journals and conference proceedings in these areas and authored three books. In 2007 he delivered the Boole Lecture at University College Cork, the school where George Boole taught from 1849 till his death in 1864. Dan Marinescu was the principal investigator of several grants from the National Science Foundation. In 2008 he was awarded a Earnest T.S. Walton fellowship from the Science Foundation of Ireland.